Like many animals, honeybees have been perceived and understood in various ways in different societies and in different historical periods. One of the most persistent significations, which has endured for several centuries and which pre-dates the modern period, is that of honeybees as workers or labourers. Well before the development of modern scientific entomology, when many of the mysteries of the honeybee colony had yet to be unlocked, beekeepers could not avoid being struck by the remarkable industriousness with which bees – and honeybees in particular – appear to go about the singular task to which all of their activities are geared, which is the task of producing and storing honey. Whatever other meanings have been given to honeybee colonies, and whatever else humans have believed about bees, they have almost invariably been regarded as workers. This is significant, because the activities of nonhuman animals are not often spoken of in these terms, as a form of work or labour. On the rare occasion that such terminology is used, it is usually meant purely as analogy, the intention being to compare certain animal behaviours with real – that is, human – labour, whilst taking it for granted that animals do not really ‘work’. The conceptual framework underpinning this is that ‘work’ properly so called is purposeful, deliberate, conscious activity, oriented toward some end or goal. It follows that only humans can be said to ‘work’, because – it is believed – animal activity is none of those things, but is merely instinctive behaviour. It might sometimes look like work, but to take this at face value is naive, because the animal does not really understand what it is doing. An example of exactly this reasoning can be found in classical sociology in the work of Karl Marx. In a famous passage in Capital where Marx is discussing the social significance of human labour, he compares the skill and ingenuity of honeybees in the construction of their honeycomb chambers, with that of human architects (1976: 284). He goes on to argue that the fundamental difference between the labour of bees and that of human architects is that, whereas the bees operate on instinct, according to a blueprint drafted by evolution, the human architect designs the structure consciously in the mind before constructing it in reality. In this way Marx toys with the idea of bees as labourers, hence as social beings, before moving to place bees firmly back within the domain of unconscious nature. Marx refers to honeycomb, but honey itself is even more telling in this respect. Honey is commonly seen as a naturally occurring thing, as reflected in the marketing of honey as a ‘natural’ product and a ‘natural’ alternative to sugar and other ‘artificial’ sweeteners. 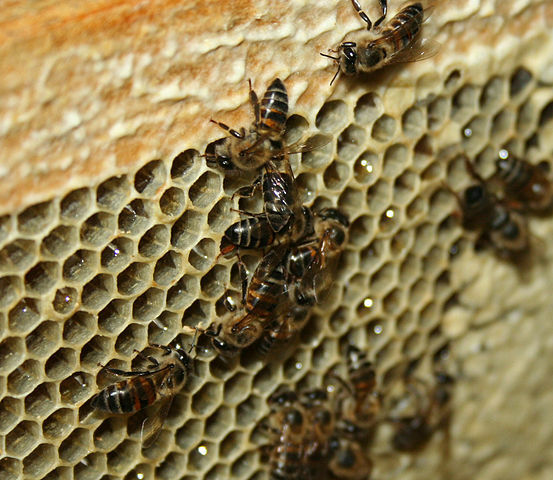 At the same time however, because it is produced by ‘worker’ bees within colonies that are seen as highly organised micro-societies, honey is also regarded as in some sense manufactured. This apparent contradiction drove anthropologist Claude Lévi-Strauss to place honeybees in an ambiguous zone between nature and culture, pointing out that even wild honeybees were markedly ‘civilised’ in their highly organised labour of transforming nectar into honey; he therefore suggested that honey is better seen not as ‘raw’ but as ‘cooked’ (1973: 28, 35, 55, 289). But if so, then the cooks are nonhuman, and in this sense honey is still conventionally categorised as ‘natural’, because apart from the work of managing the hives and periodically extracting the ready-made honey and putting it into jars, no human labour enters into its production; the actual work of converting nectar into honey is performed entirely by the bees themselves. Such ambiguity underlines the tensions inherent in trying to categorise a nonhuman animal which exists in structured societies engaged in highly organised collective work dedicated to the production of something valued by humans. Other animals produce things of value to humans of course – cows produce milk, chicken lay eggs, but not through highly organised collective activity which lends itself so well to being categorised as ‘work’; and other animals produce things through highly organised activity – beavers build damns, birds make nests, spiders spin webs; but these products are not highly valued by human beings. Even more significantly, there are no other ‘livestock’ animals whose products we consume, but whose bodies we do not. For all these reasons, honeybees have no equals when it comes to exposing the fragility of the conceptual framework that underpins our notions of what is ‘natural’ and what is ‘manufactured’. Levi-Strauss, Claude (1973) From honey to ashes: introduction to a science of mythology, II. London. Cape. Marx Karl (1976) Capital: a critique of political economy: volume I. London. Penguin. Excellent. Incisive and tight. I wonder about the societies where people do consume the body of the bee, and the implications this has on the conceptual ambiguity. And even more precisely, whether they eat the larvae and/or pupae and/or adults.